Important! More CITI dollars required to redeem cash rebate from 2 Feb 2015 | Cheaponana.com - The best credit cards in Singapore and other deals to help you save, earn and maximise your money! For Citibank cardmembers holding either a Citibank Classic, Gold, Platinum, Ultima, Business Gold Visa, Clear Visa, Clear Platinum, Citi Prestige, Citi Rewards Visa Signature or World Mastercard, you will automatically receive Rewards Points (aka CITI dollars) with every dollar that you spend on the respective credit cards. Amongst these cards, the Citi Rewards stands out as it provides 10 CITI $ per $1 spent in participating shops dealing in clothes, shoes or bags as their main business venture. The CITI $ are very flexible as you can exchange them for shopping vouchers, airline miles or even cash rebate. If you are not aware, for Citibank Classic, Clear and cardmembers, your Rewards Points will be valid for a period of 1 year. For Citibank Gold or Platinum and Citi Rewards Visa Signature or World MasterCard cardmembers, Rewards Points are valid for a period of 5 years. For Ultima cardmembers, Rewards Points have no expiry. Now, if you have not accumulated enough CITI dollars to exchange for miles, or you are not keen on exchanging for shopping vouchers, then the next best thing to do is to redeem your Citi $ for cash rebate. The below table shows the rate for exchange – 3000 CITI $ for $10 cash rebate. To earn 3000 CITI$, you only need to spend $300 on your Citibank Rewards card during your shopping spree and this will translate to a 3.33% cash rebate! 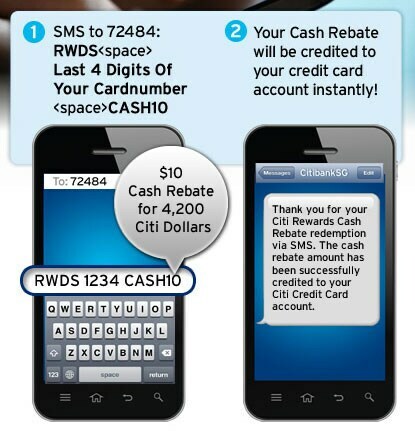 Come 2 Feb 2015, the amount of CITI $ required for a $10 cash rebate will increase by 20% to 3600. That reduces the effective cash rebate to 2.78%. Still pretty decent, considering that some rebate cards entice people with a cash rebate of 0.3% and people do spend on these cards, but why wait till then? If you have amassed a lot of CITI $ and the expiry date is looming, do check out the Citibank catalogue and decide on your redemption gifts. If your preferred choice is cash rebate, then please go ahead and SMS to 72484: RWDS <SPACE> last 4 digits of cardnumber <SPACE> CASH10 to redeem for $10 cash rebate. Use CASH20 for $20 rebate and CASH50 for $50 rebate. Do note that the cash rebate will go back to your credit card account to be used to offset your credit card bill. There is no limit to how much you can redeem and the service is free! Do read the FAQs here before you proceed.